The RocketRAID 2720SGL two standardized SFF-8087 ports are fully compatible with the latest 3TB hard disks, and can support SAS and SATA devices in a multitude of storage configurations, including non-RAID JBOD's, single disks, and RAID arrays including 0, 1, 5, 10 and 50. The RocketRAID 2720SGL is compliant with all major operating systems including Windows, Linux and FreeBSD, and utilizes Highpoint's unified web-based management interface, which allows both novices and experts to quickly configure, manage and monitor storage configurations. 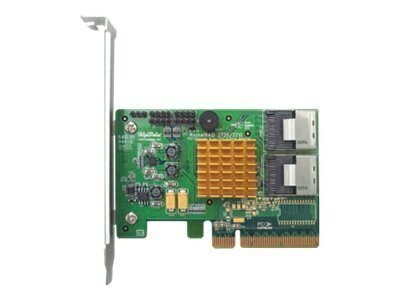 The RocketRAID 2720SGL is fully backwards compatible with SAS/SATA 3 Gbps devices, PCI-Express 1.0 and 2.0 motherboards, and can be easily integrated into a clients existing storage infrastructure. RocketRAID 2720SGL, utilize unified firmware architecture. Client's benefit from the clear, hassle free upgrade path; storage configurations can be easily scaled, shared, and migrated between all RR2700 series HBA's, including future product releases.